The application object run() method is responsible for the initialization step of the main add-on. It is called once by framework loader at startup. Returns the name of the method (without any prefix) that will be invoked within the main addon. $action = $this->app->action(); will set $action to 'show_form'. Methods in addon classes are accessible from an HTTP request only if they are defined with special prefixes. Any other method defined in an addon class can't be accessed via an external request and can therefore be considered as private to the application. when called without parameters. Each array element will have the language prefix as key and the language name as value. When called with a language prefix parameter, it will return the language name. 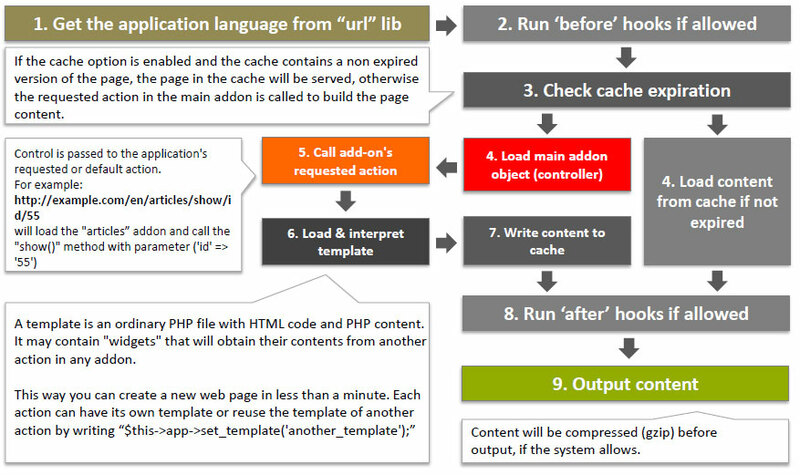 Returns true if the html page content could be retrieved from the cache and was loaded in the output buffer. Redirects to the "Error 404 - Page not found" page. In this case, application will send actual 404 header status. If given an argument, this method will return the value of the parameter whose key is the argument if it exists. If the key is not defined, this method return an empty string. Sets an HTTP response header. Since the framework buffers all output, you don't have to take particular precautions not to produce any output before calling this method. The optional replace parameter indicates whether the header should replace a previous similar header. After this call, all invocations of the language() method will use the ru.ini translation files. Changes the template to be used for the page display. This method can be used to override the default template, if you want to use the same template for several addons or actions. For example, if the addon name is 'test' and the action is 'show_form' the default template will have the name 'test.show_form.tpl.php'. with the application templates overriding the framework ones. Returns the name of the application defined theme. Themes gives the posibility to use several different styles in project as is customary in many CMS applications. Returns the path of the application defined theme. Returns the url of the application defined theme. Returns the framework url if it is accessible. In this case, calling this function from any application instance will return the actual library url.